At Tailormade, we specialise in sewing furniture. With our furniture, storage solutions abound through the use of specialised trays ideal for threads, bobbins, notions and even a place to hide your extra machine. 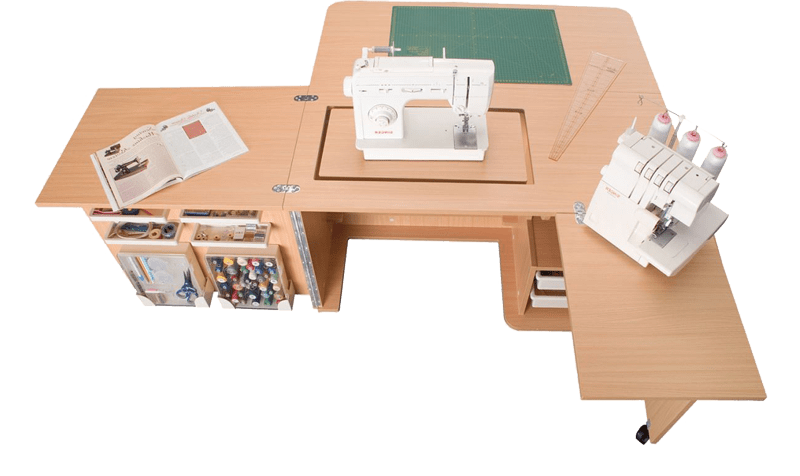 The fully assembled range are quality sewing furniture, that neatly folds down to hide the sewing machine whilst not being used. There is no assembly required. Beautiful cutting tables with large sewing work area, German-made lifts, and more. This is modern sewing furniture for today’s crafter. 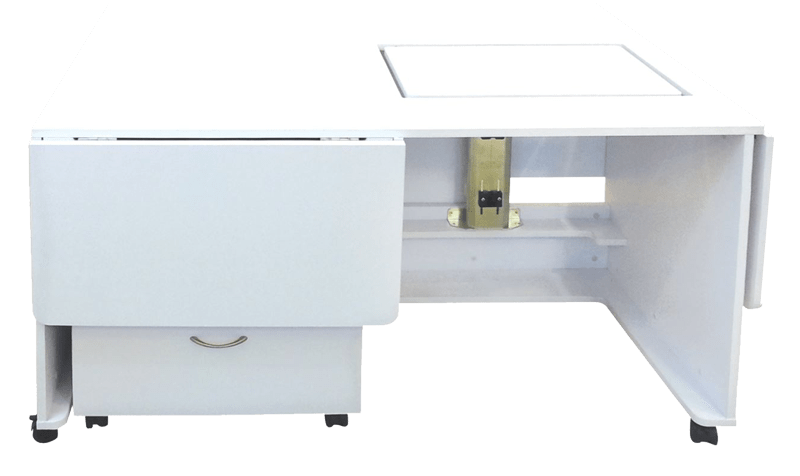 With a wide and stable surface working area of 1.8m x 1m and just the right height to help reduce back fatigue from repetitive bending, the Tailormade cutting table is great to have in your hobby room. This cutting table heights comes at 87cm for comfort and uses magnetic points for extra stability. There are 4 plastic drawers for storage and 1 cabinet with an adjustable shelf. 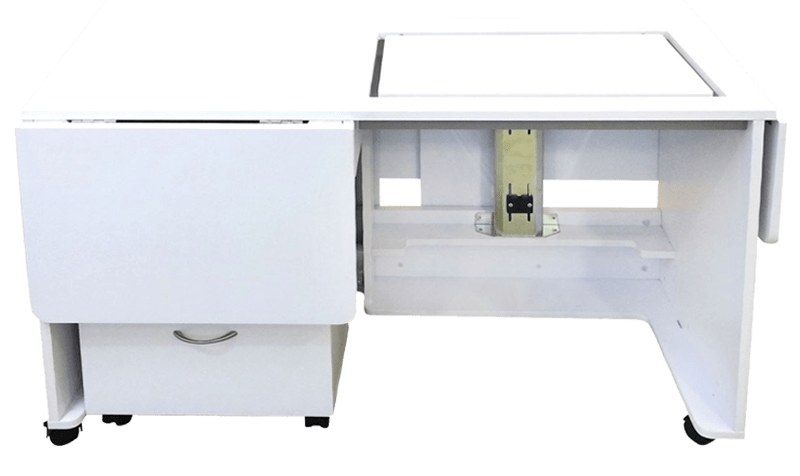 The cutting table provides a large stable work surface of 1.8m x 1m. The height helps reduce back fatigue caused by bending. With it’s four fold out doors positioned magnetically, it is much more stable than other fold down tables in the market. You are ensured a tidy work area whilst providing quick access to the storage drawers and shelves. With a large working space and a specialised storage for notions, tools, hidden drawers and cupboards to fit your overlocker in. All the space, storage and flexibility of the Eclipse earned its popularity in the Tailor made range. This cabinet is tailor made to suit you and available in left or right hand configurations. Featuring a large work surface with specialised storage for notions and tools the hidden drawers and cupboard can even fit your overlocker. 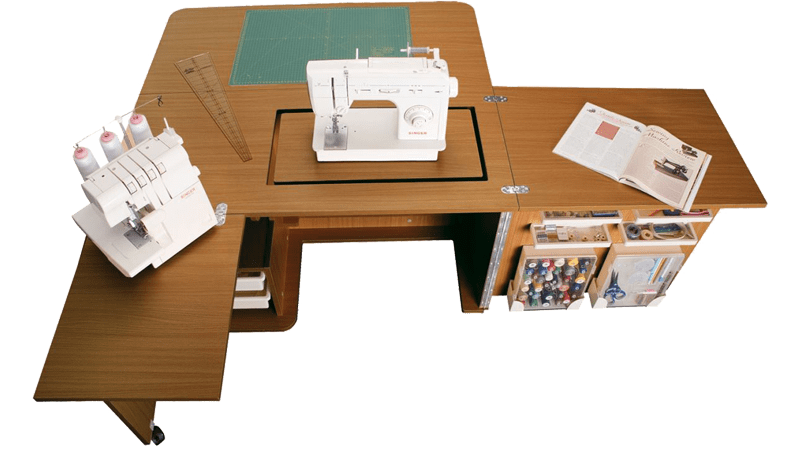 The Eclipse provides an all-in-one sewing cabinet to keep everything you need to create your masterpiece within arm’s reach. Available in a right or left hand configurations. The Gemini Cabinet is designed for smaller studios. A compact yet spacious when opened and have access to all your tools comfortably. With snag-free storage compartments and shelves, you will have a more accessible and functional work space. A very impressive unit with a wide working space, specialised storage and a back leaf to keep your projects off the ground. 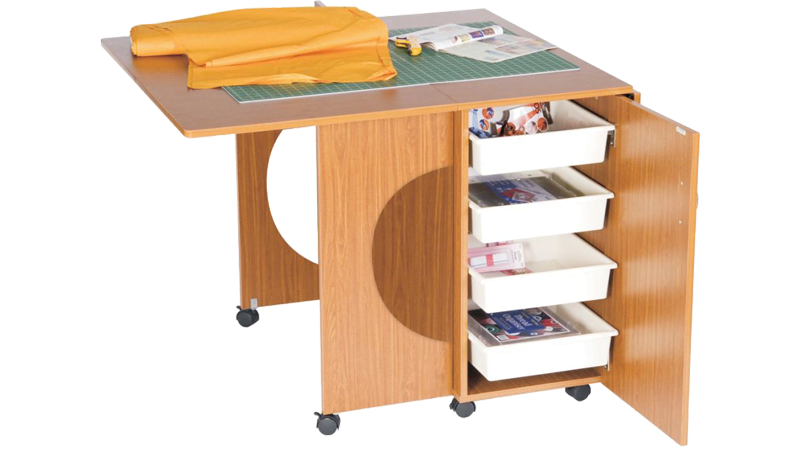 This Collapsible cabinet with a wide working space is the second largest unit in the Tailormade range. This set up will suit a hobby enthusiast with a mid-sized studio. 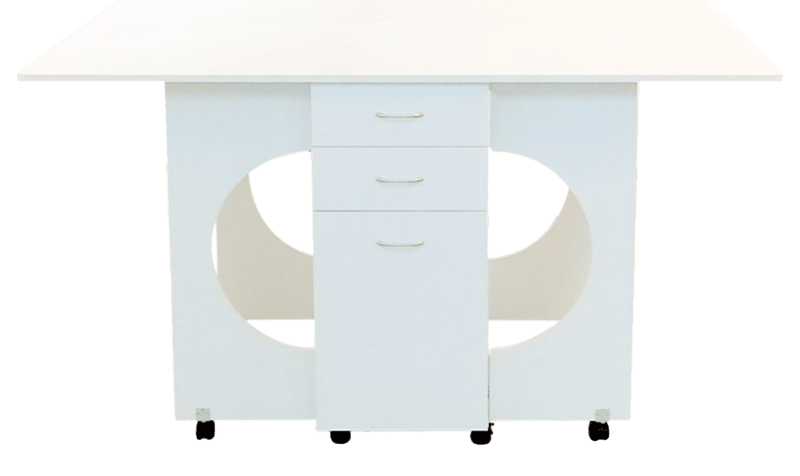 With the mobility of the storage caddy that can be placed where you want comfortably or have it as a place to setup your overlocker within arm’s reach. One of the largest sewing cabinets with optimal storage space that can accommodate large sewing machines in the market today. Designed for a much bigger studio the Quilter’s Vision has a large back leaf and side panels that’s gorgeous to look at. 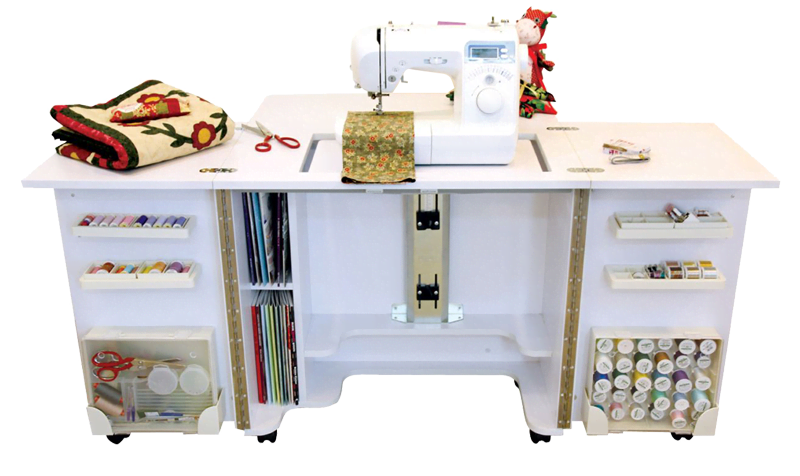 Quilters and dressmakers would enjoy working on this cabinet with the removable caddy that can be positioned anywhere comfortably.